This afternoon I found myself with a punnet of Blueberries, and a double size punnet of Strawberries, so decided to try something new. 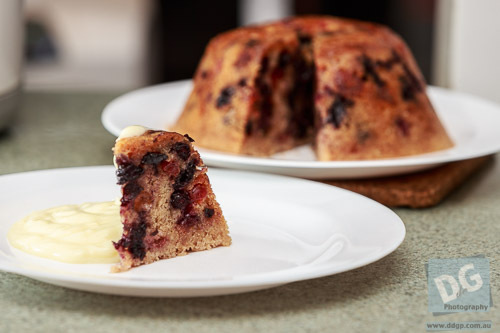 I’m a big fan of steamed puddings, and have discovered that you can make them in a slow cooker without all the fuss doing it on the stovetop, so the idea of a summery berry pudding came to mind. Soften the butter slightly. In a large mixing bowl, combine the butter, semolina, flour and sugar and work through with a whisk until you have a breadcrumb like mix. Add the spices, mix well. Add the eggs, and whisk until combined. Add the rum and whisk well. Now add all the fruit and stir it well with a spatula. Once combined, transfer the mixture to a greased pudding bowl. Cover the bowl with two layers of baking paper, and tie up with string (around the lip, then over the top as a handle). More string doesn’t hurt, possibly crossed underneath the bowl to avoid the handle coming loose when it’s time to remove from the cooker. 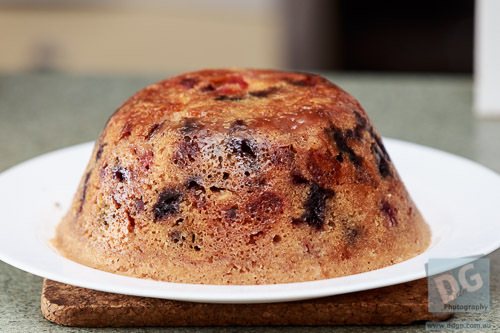 Place the pudding bowl on four small rounds of cork (to keep it off the base of the slow cooker) inside the slow cooker. Fill the slow cooker with water up to the lower lip of the pudding bowl. Place the lid on the cooker, and set to High. When done, remove from the cooker, remove the paper and string, and turn out onto a plate. Best served with Custard (flavoured with vanilla and rum).